In many ways, 2018 was a banner year for initial public offerings. With more than $46 billion in deal proceeds coming from 190 IPOs, according to Renaissance Capital, 2018 was the strongest year for both metrics since 2014. However, not every sector saw its fair share of pops in trading on the public markets. In fact, through the second week of December, only six sectors out of 11 tracked by the firm posted positive returns from companies going public in 2018. Only six sectors posted positive returns for companies going public in 2018, according to Renaissance Capital. The top two sectors’ performance were somewhat skewed due to a small number of companies and their positive returns. For example, BJ’s Wholesale Club (BJ) was the only consumer staple company to go public this year, single handedly making its sector the top IPO performer. Consumer discretionary, which placed as the second strongest sector, was heavily boosted by the top IPO of 2018 — Canadian cannabis company Tilray (TLRY) — its shares has risen over 300% from its IPO price of $17. Excluding Tilray, the sector posted a 1% loss due to weakness from brands like insulated drinkware company Yeti (YETI) and smart speaker startup Sonos (SONO). 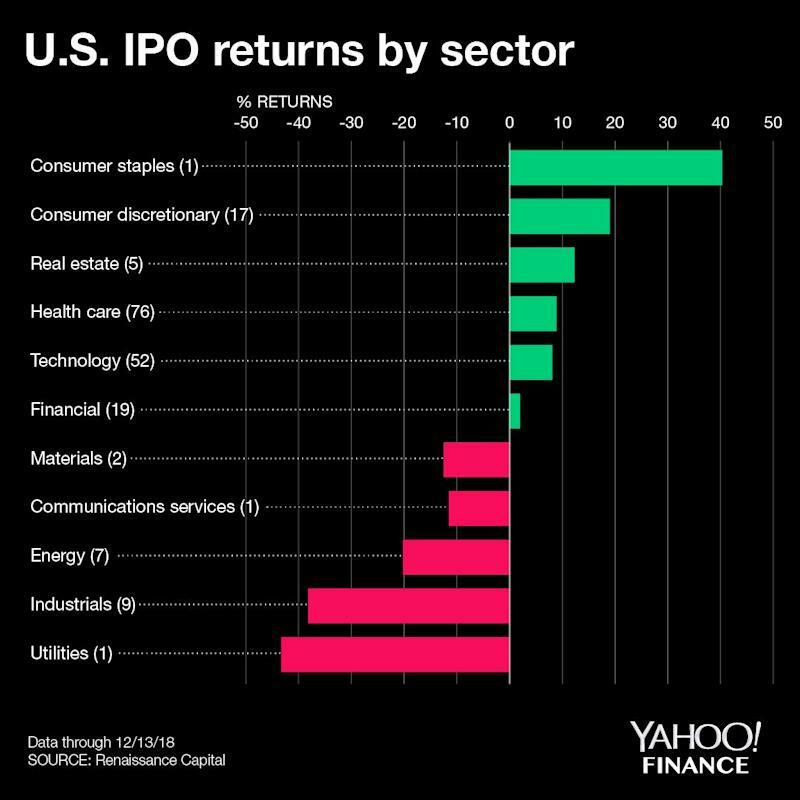 Energy IPOs also lagged, with the sector notching its fourth consecutive year of underperformance. Industrial IPOs, which collectively had the strongest 2017, would have posted the weakest performance as a group in 2018 were it not for the utility sector which was solely represented by a single company Argentina’s Central Puerto (CEPU), its shares have fallen more than 40% this year. However, two recently completed Chinese IPOs, fashion app Mogu and Tencent Music (TME), may have indicated a shift in IPO sentiment as market volatility increases. Both companies priced shares at the bottom of their respective IPO ranges, hinting at weakening demand for public offerings. The relatively weaker performance of companies listed since November echoes that sentiment, and even led some investors to speculate that some IPOs planned for 2019 could be delayed if market volatility continues.